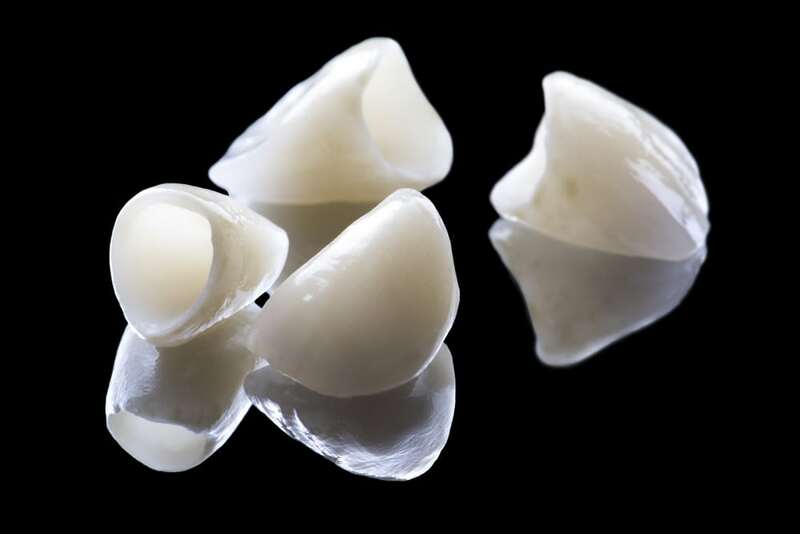 Dental crowns – also known as caps – are custom-fitted tooth prosthetics fixed over the surfaces of natural tooth structures or dental implants. They are non-removable and must be cemented in place by a licensed dentist. Patients who get crown to restore their smiles achieve both the function and appearance of natural, healthy teeth. Zirconium crowns are metal-free crowns that are instead made of a semi-transparent ceramic with an opaque core. Their composition allows Zirconia-based restorations to take on an exceptionally natural appearance, making them virtually undetectable to anyone who is not a dentist. Zirconia ceramics provide the strongest and longest-lasting solution for dental restorations – all with the guarantee of no metal oxidation that would result in graying or darkening of the margins near the gum line. This makes them an ideal solution for restorations in both the anterior and posterior teeth. that the Etruscan civilization were the first to use crowns as a means of restoring damaged teeth? In fact, the materials they used – ivory, gold, and bones – were still the standard in dentistry as recently as the 20th century, when porcelain crowns were first invented. Today, crowns are customized specifically for the patient’s bite and can usually be placed in as little as one or two dental visits. With proper cleaning and regular dental check-ups, crowns can last many years, or even a lifetime. If you have a tooth that is damaged or decayed, but still intact, a dental crown may be right for you. Schedule an office consultation to determine whether you could benefit from a metal-free crown. What should I expect when I have my crown placed? If you are a candidate for a metal-free crown, your teeth will be reduced to ensure a proper fit. An impression will then be taken of your bite and used to fabricate a mold for the crown. If you are choosing porcelain prosthesis, its color will be matched to the natural shade of your other teeth. If a dental lab is making your crown, you may be fitted with a temporary restoration until the permanent one is ready for placement. Your teeth will need time to heal following the crown placement process, so it is normal for you to experience some sensitivity – especially to hot and cold. Additionally, you may experience soreness in the gums surrounding your restorations, though this is usually manageable with ibuprofen and should subside within a few days.